You've been invited to play the role of SOUX PATROOPA in Murder at the Disco. New York, 1977. Hot nightclub Disco 54 is hosting a birthday and only the coolest people are there. 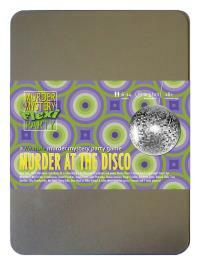 But before anyone can 'get down on it', nightclub owner Doctor Disco is found dead in the VIP lounge! Join us to find out whodunit! You’re instantly recognisable in your white t-shirt dress cinched at the waist with a gold belt. Add blonde hair and white gogo boots and you’re done. Halla, I am Soux Patroopa, pretty blonde singer of Swedish pop group ‘The Dancing Queens’ - you have heard of us ja? I am sorry the other members of my group couldn’t be here tonight but Björk, Bjönny and Bjïngo sadly got stranded at Gothenburger airport. But I am here, although I sadly did not arrive at Disco 54 until after Doctor Disco was killed. So I will never get to see his, how you say it, ‘pickled’ face again.